My experience as a student and instructor at Sling Pilot Academy was truly amazing. To begin, the atmosphere at Sling Pilot Academy is unlike any other flight training environment. Instead of feeling like just another customer, the staff treat you like family and take a personal interest in your success. From day one you are greeted with a smile in a professional environment that encompasses all that is necessary to build your ratings and land a job at the airlines. One of the key benefits of attending Sling Pilot Academy is the truly modern aircraft you will learn in. The Sling aircraft designed and manufactured by The Airplane Factory features the latest and greatest glass avionics that help you learn the skills that directly transfer to the avionics you will be expected to know from day one in your first airline job. When you get into ground school at your first part 121 airline it will be intense, and they will not have time to teach you how to interpret a glass panel. Having the hands on experience with glass avionics in your initial flight training will give you a leg up when you get to that point in your career. After gaining my initial ratings at Sling Pilot Academy, I taught for over 1000 hours as a flight instructor at the school. I had the opportunity to sharpen my instructor skills in a safe and supportive environment with the guidance of many experienced instructors and on-staff Designated Pilot Examiners (DPEs). The weather in the Los Angeles area is phenomenal, so I was as busy as I could ever wish and was able to build hours and move onto the airline as quickly as I desired. With that said, I never felt pressured to fly in poor weather conditions, and always felt that safety was the number one priority. Teaching and learning in the busy airspace just south of Los Angeles International Airport is a great challenge that truly prepares you for your future career. Another key benefit of attending Sling Pilot Academy is an inside look at the design, maintenance, manufacturing, and sales of the aircraft you will learn and eventually instruct in. The owners of Sling Pilot Academy also own a part of the company which manufactures the same aircraft you will be flying in. This means they know every single nut, bolt, and rivet that make up the airplane! You will have the opportunity to take part in hands on learning with these experts. In short, learning to fly at Sling Pilot Academy was unmatched. It was an affordable environment that fast-tracked me to the airlines in a third of the time that it would take to complete a four-year degree program and instruct at an expensive aviation university. 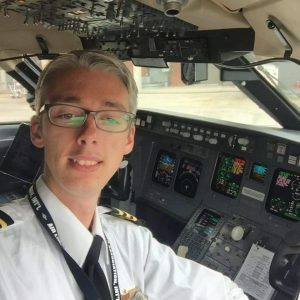 After completing my flight training and building hours, I quickly landed my first airline job at Endeavor Air (a Delta Connection carrier). I was already building seniority and part 121 flight time to move onto the majors while I worked towards completing my four year degree online. Without a doubt, this is the way to get into an airline job as quickly as possible. I walked away from the experience without any student loan debt, and I was already years ahead of my friends who had opted to go the aviation university route. I encourage anybody who is pondering Sling Pilot Academy to reach out to me personally for any advice or recommendations on their future career goals.